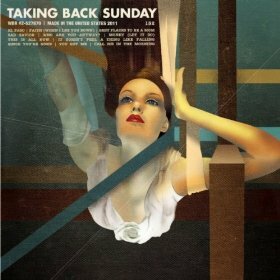 It’s been two years since Taking Back Sunday released an album (2009’s “New Again”), so this self-titled released was greatly anticipated. TBS has gone through several line-up changes over the years, but this fifth album contains all original members from the Tell All Your Friends era: Shaun Cooper (bass), Adam Lazzara (vocals), John Nolan (guitar), Mark O’Connell (drums) and Eddie Reyes (guitar). “Sad Savior” is definitely the most advanced track on the album lyrically, although it’s difficult to dissect the words as caring or cynical, while “It Doesn’t Feel A Thing Like Falling” is easily the best track here, although still mediocre at best. Overall, this self-titled release is definitely more cohesive, refined and polished than any previous efforts, and the band still has a knack for crafting addictive hooks and melodies. Sadly though, none of the eleven tracks present here stand out, nor does the album as a whole in terms of thematic devices. Maybe next time. Tags: john nolan, lucy tonic, taking back sunday, Warner Bros.